The tympanic membrane is also called the eardrum. It separates the outer ear from the middle ear. When soundwaves reach the tympanic membrane they cause it to vibrate. The vibrations are then transferred to the tiny bones in the middle ear. The middle ear bones then transfer the vibrating signals to the inner ear. 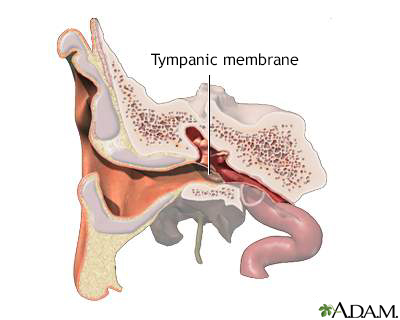 The tympanic membrane is made up of a thin connective tissue membrane covered by skin on the outside and mucosa on the internal surface.